John Saunders reports: A sole leader emerged from round four of the 2019 Gibraltar Masters, played on 25 January at the Caleta Hotel. 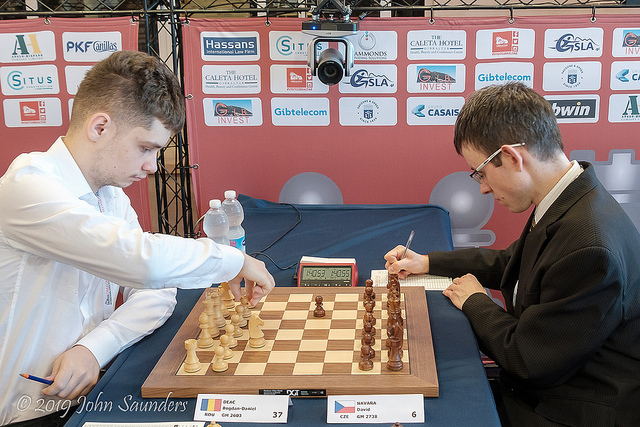 David Navara (Czech Republic) now stands proudly at the top of the list after defeating Bogdan-Daniel Deac (Romania) with the black pieces and proceeding to 4/4. Nine players are on 3½/4: Wesley So (USA), Nils Grandelius (Sweden), Arkadij Naiditsch (Azerbaijan), Gabor Papp (Hungary), Rinat Jumabayev (Kazakhstan), Michael Adams (England), Baskaran Adhiban (India), Barathakoti Harshan (India) and Sarasadat Khademalsharieh (Iran), who is the lowest rated of the nine and who leads the hunt for the lucrative women’s first prize. In yesterday’s report I presented David Navara’s and Sarasadat Khademalsharieh’s wins from round three. Looking through the games played in round four, I’m half-tempted to do the same again. It’s started to become the David and Sara show. But perhaps not: both games were somewhat technical in nature. David Navara’s chess runs contrary to his own seraphic nature: he harried and bullied his opponent into submission with a series of thrusts and blows all over the board, which is something that David the man (rather than the chess player) would never do to a living soul. One hundred per cent of David’s aggression is channelled into his chess moves, leaving nothing behind but serenity. Much the same seems to be true of Sara (I hope I can refer to her by that shortening of her name): she is a formidable opponent at the board but a delightful and bubbly personality away from it. In today’s game, though, she faced the might of Levon Aronian. The great Armenian seemed to be gradually imposing himself on the game and consolidating his extra pawn when he made an uncharacteristic mistake which lost the pawn back and obliged him to seek a perpetual check. Nevertheless, a great effort from Sara as you could argue that Levon’s mistake was born of pressure brought about by her tenacious defence. The game between Daniele Vocaturo and Maxime Vachier-Lagrave was a Najdorf Sicilian and developed into a complex struggle. Stockfish 10 opined that the Italian GM might have secured a +1.49 advantage had he opted for 33.Qc2 but I’m wondering whether the analysis supporting this idea might not be fit for human cogitation, and certainly not with the clock ticking. Having held a possible edge (at least in the virtual eyes of the computer), Vocaturo suddenly found himself under pressure but he defended adequately to a level position at the time control. Another game which exploded like a shooting star and then fizzled out into a draw was the one between Gawain Jones and Alejandro Ramirez. It started with an innocuous-looking Exchange French but Gawain was in a playful mood, feigning as if to fianchetto his kingside bishop and then locating it elsewhere, and then lurching towards the enemy king with a knight, sacrificing the light-squared bishop altogether. This required the most precise of defences but Alejandro proved up to the task. Commentators Simon Williams and Jovi Houska were full of praise for the imagination and enterprise shown in this game. It’s a good example of a draw with far more spectator appeal than many a mundane decisive game. There were some other fascinating battles between elite players and leading female competitors. Kateryna Lagno has been in very good form recently but she was up against former world number four Mickey Adams in his best grinding form. Most of the pieces were hoovered off in double quick time, but Adams was able to outplay his opponent, but only as far as reaching an opposite-colours bishop endgame in which he had an extra pawn. 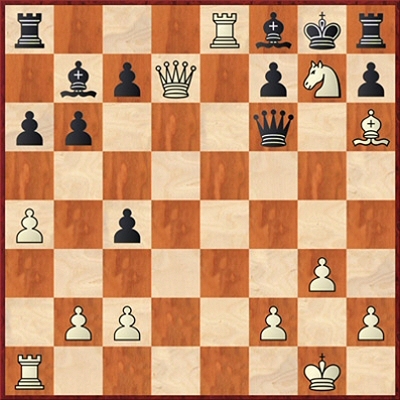 You would have bet on a draw since Adams didn’t even have a passed pawn but he managed to engineer two connected passed pawns. Even so the position was probably a theoretical draw but it proved beyond Kateryna’s capabilities to hold it. Mariya Muzychuk didn’t seem to have any problems in drawing against 2690-rated Ivan Saric of Croatia. Nigel Short played a powerful-looking exchange for pawn sacrifice against Humpy Koneru but, despite shedding a second pawn, the Indian grandmaster defended resourcefully and came close to turning the tables before the game ended in a draw. Perhaps the most gripping of the various battles of the sexes (which whets the appetite for the traditional match of that name taking place on Saturday night) was Ju Wenjun versus Vassily Ivanchuk. 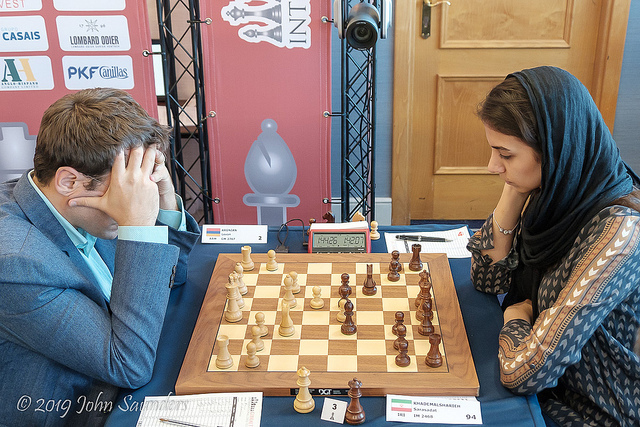 This was another long grind, with the difference that it was the female star going for the win after an inaccuracy from Chucky towards the end of the first time control had allowed the women’s world champion to annex a pawn. 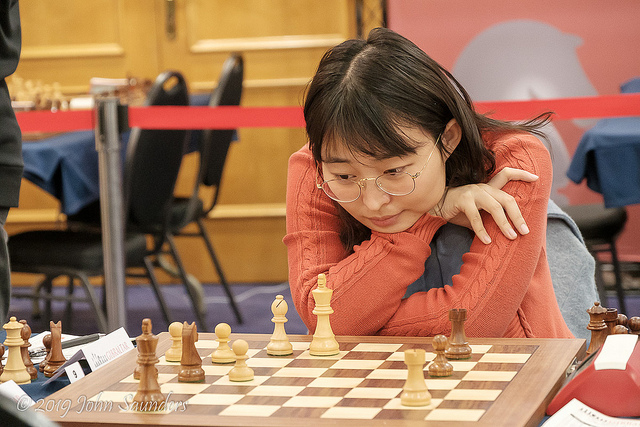 Though she fought long and hard, the Chinese player was unable to convert her material advantage against the Ukrainian’s typical endgame artistry. But it was a worthy struggle.